Constructing a strong community requires leaders dedicated to engineering character to develop a concept and move it to completion. They build on their own skill set, but they also know the importance of networking and reaching for the strengths of others to realize success. 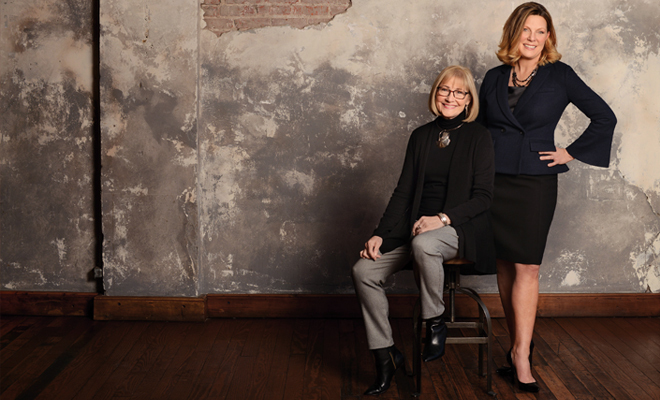 Laura Shultz and Ann Smith-Tate have called on these qualities and the assets of others in their pursuit of good and are being recognized as the 2018 HERLIFE Magazine Women of Influence. Laura Shultz can’t play an instrument, but that hasn’t stopped her from building a successful musical program, keeping at-risk kids in school and changing their mindsets. She’s the maestro of Harmony Project KC, based on the campus of the Northeast Community Center in Kansas City, which has served children and families through cultural, educational and social programs in the historic northeast area of Kansas City, Missouri, since 1940. While many might have worried about striking a sour note with a program they knew little about, Laura challenged herself to bring Harmony Project KC to this area. She’s never been one to shy away from a challenge, from serving as a pediatric registered nurse in the Peace Corps in South Korea to establishing herself as a commercial photographer/businesswoman and then a nonprofit leader. She has been executive director of NECC since 2008. This was an incredible achievement given the community environment. Although it’s improving, the northeast portion of Kansas City continues to suffer a local dropout rate of 40 percent, with skyrocketing crime and poverty. The immigrant population is high; 28 languages are spoken in the area. Seven diverse neighborhoods cover an area running from River Market on the west to Interstate 435 on the east, to the Missouri River on the north and Truman Road on the south. Harmony Project KC is an affiliate of the acclaimed Harmony Project Los Angeles, an arts-based youth development program tailored to low-income youth. It was recently recognized with the nation’s highest honor by the President’s Committee on the Arts and Humanities. Harmony students boasted a 100-percent college acceptance rate, including two Fulbright Scholars. The positive effects music can have on a child have been scientifically proven. According to a recent five-year study by the University of Southern California, music instruction seems to accelerate brain development in children, most notably in the areas responsible for processing sound, language development, speech perception and reading skills. The study demonstrated that the acceleration can be significant for those who studied music. Harmony Project KC started three years ago with 33 kids from 20 different schools. Now, more than 100, from first to 12th grade, train at the Northeast Center, with 40 more studying at nearby Garfield Elementary. Three days a week they gather to study music, playing either violins or cellos, flutes or clarinets, or singing in a choir. With a strong commitment from their parents, children spend several hours each week in class at Harmony Project KC and even more time at home practicing. In addition to the musical training, the program helps students earn college scholarships. For Laura, the sweet sound of children playing instruments is music to her ears. Her dream is to carry her tune of musical positivity to other Kansas City areas as a way to give kids the right start in life. Her greatest hit enhances the lives of the children and families through the power of music education. She finds herself in a very dynamic role. Shawnee is one of the fastest growing cities in the Kansas City metropolitan area and in the state of Kansas, with growth increasing at a rate of 25 percent or more every decade. A good part of that success is based on the partnership among the business community, Shawnee Chamber EDC and city government. Ann and the Chamber’s community partners focus on efforts to expand the business base of the community. The organization also helps businesses in Shawnee continue to succeed by offering unique learning opportunities, networking and advocacy for a better business climate.